A couple of weeks ago, my brother very helpfully (and forcefully) pointed out that there seems to be a tragic lack of cookie recipes on this site. Among all the cakes and tarts and pies aplenty, thus far I’ve logged a sad total of a mere two cookie recipes. How is this even possible? Cookies are divine. I love cookies. Everyone loves cookies. But is it somehow even imaginable that, of all the baked goods available to my baking whims, maybe cookies reside at the bottom of my list of preferred baked goods? No. Not true. As proven by my excitement over the discovery of the magic that is the cookie exchange, I think it’s fair to say that cookies and I, we get along just fine. Thus, choosing to classify the sore absence of cookies on Savory Salty Sweet as a mere oversight, and certainly not a deliberate snub, it’s high time I remedied the problem. 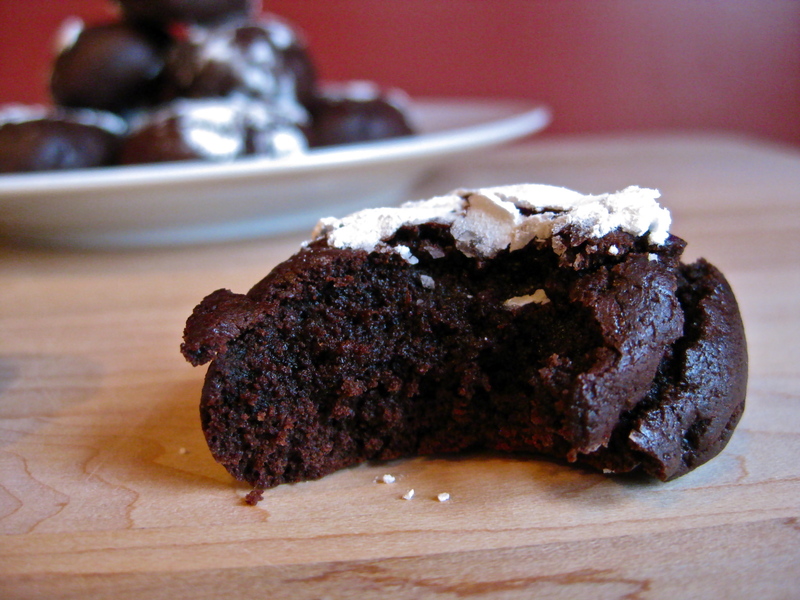 I love a good chocolate crinkle cookie, which is oftentimes a shame, as it seems as though I’ve eaten a lot of really bad chocolate crinkle cookies. 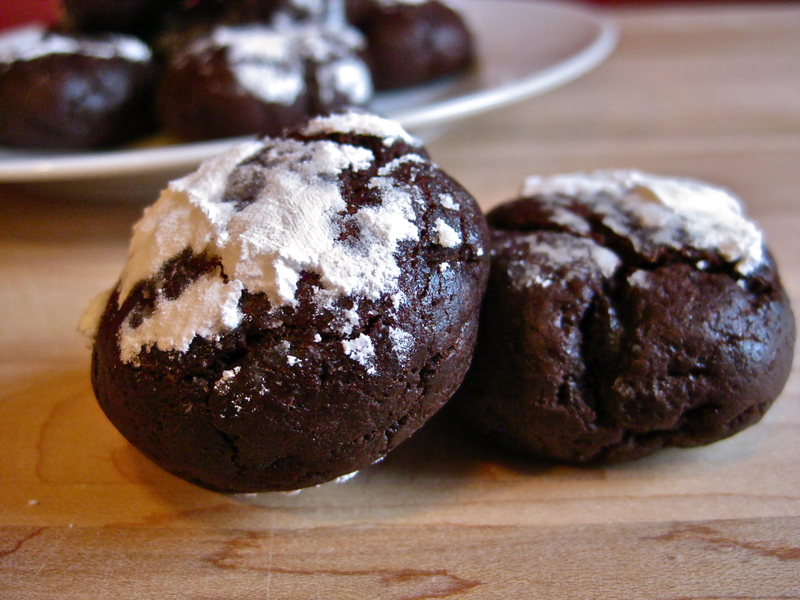 Cookies with tooth-aching sweetness, no chocolate punch, or a decidedly sandy texture are not fine representations of a chocolate crinkle cookie (or any other cookie, for that matter), but that’s frequently what one gets when trying to indulge in such. Determined to alter the trajectory of what seems to be the downward spiral of a cookie that used to be—and should be—held in such fine regard, I set to work trying to make a chocolate crinkle cookie that would have all the elements I loved most about the cookie: deep chocolate flavor, perfectly moist texture, and a satisfying sweetness that never fell to the side of cloying. The good news is, I made some very fine cookies. The bad news is, I don’t know if anyone who was looking for a traditional chocolate crinkle cookie would eat one of these and declare it the final destination of their search. Believe me, these cookies are fantastic—rich, moist, and completely satisfying—but they are a long way away from what I started out intending to make. First of all, when I was deciding how much to punch up the chocolate flavor in this cookie, I very suddenly figured that if I was going to add a bit of espresso powder to the dough to make the chocolate shine, maybe I’d actually just add a whole bunch of espresso powder. Why? Why not? And while I was at it, why not add a bit of peppermint extract to the mix, for no other reason than, hey, here’s a bottle of peppermint extract sitting right next to the bottle of espresso powder, why not throw in some of that as well? Though I generally would not condone this haphazard method of recipe creation (imagine what might have happened if there was a bottle of zucchini relish or hot mustard next to the espresso powder), in some cases, when you decide to improvise, things turn out in your favor. And, incidentally, the favor of those around you who happen to enjoy eating cookies as much as you like making them. 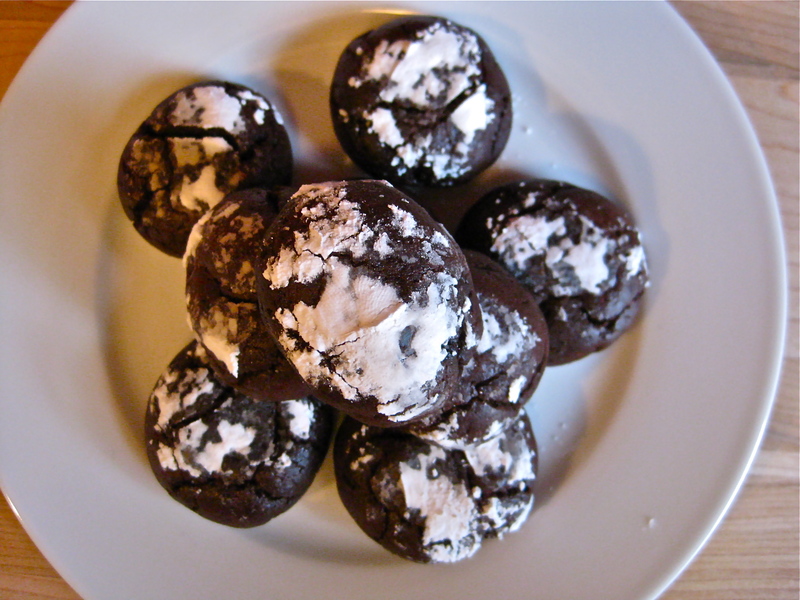 Deemed supremely acceptable by the original requester of cookies, these cookies made for some mighty delicious treats, suitable for anyone and everyone you know who adores cookies with a perfectly soft and chewy bite, intense chocolate flavor, and a hint of peppermint. You know: all humans. The peppermint flavor in these cookies is meant to serve as one of many elements going on in terms of flavor. Because of that, the amount of peppermint extract I list here will produce a cookie with a nice mint tone, but not a brisk slap of mint. If you want to make a cookie that is more mint-forward, increase the amount of mint extract to a full teaspoon. Note: This cookie dough will need to be chilled for at least four hours, so plan ahead accordingly. Be even more ahead of the game by chilling this dough overnight and then baking the cookies at your leisure when you wish to eat them. In a medium bowl, whisk together the flour, baking powder, and salt, then set aside. 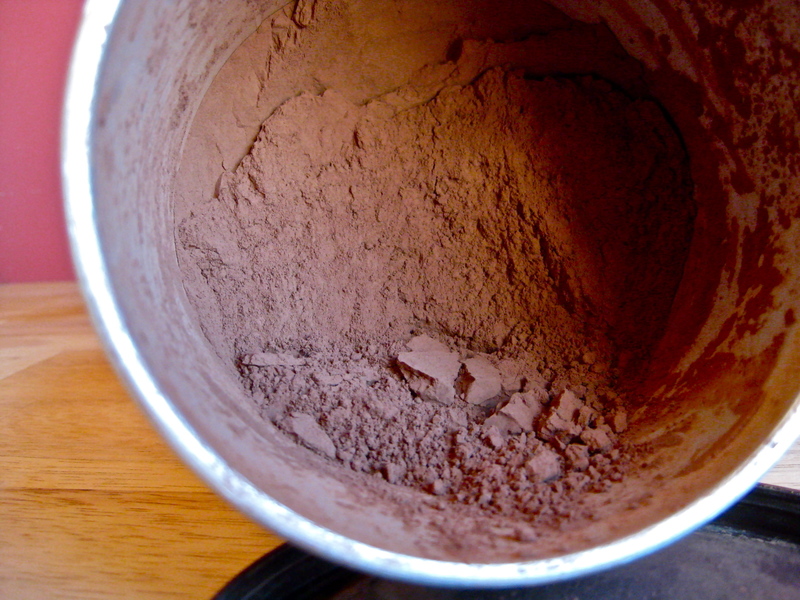 In a large bowl, or in the bowl of a stand mixer, mix together the cocoa powder, sugars, oil, and espresso powder until combined. 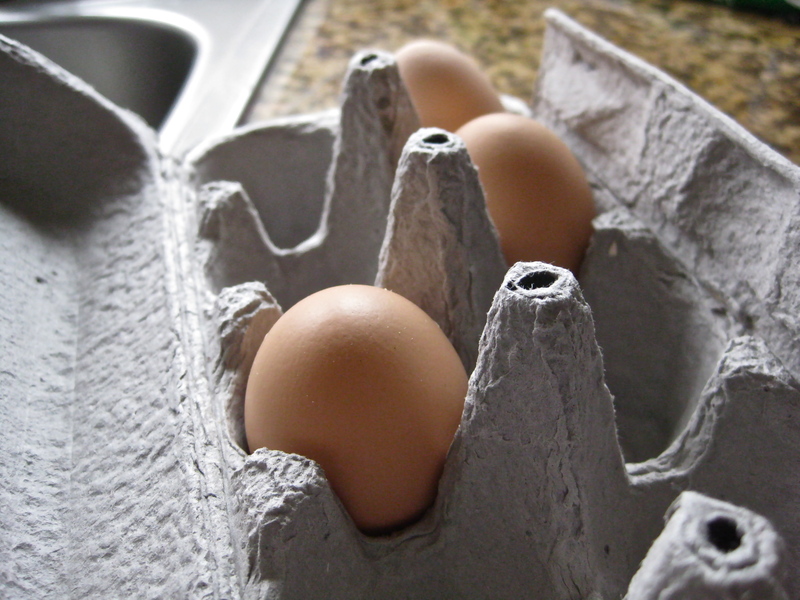 One at a time, beat in the eggs, thoroughly mixing in between each one. Stir in the vanilla and peppermint extracts. 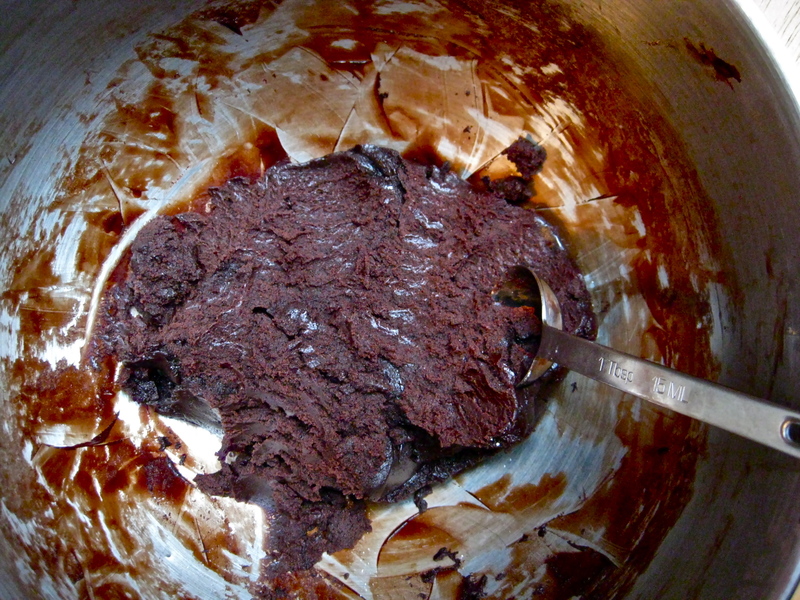 Add the flour mixture to the cocoa mixture, stirring to thoroughly combine. Cover the bowl with plastic wrap and allow the dough to chill in the refrigerator for at least 4 hours. When you are ready to bake your cookies, preheat the oven to 350 degrees Fahrenheit. Line a baking sheet with parchment paper. 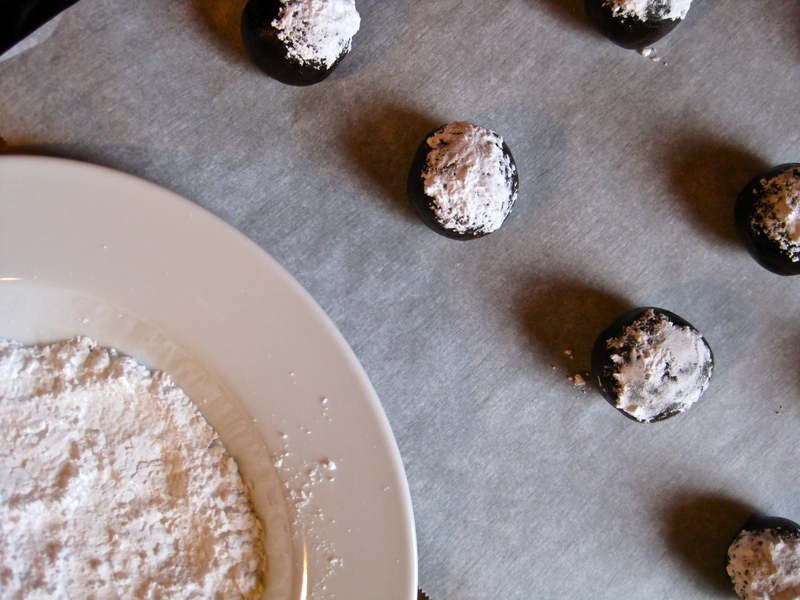 Pour the powdered sugar onto a small plate or into a shallow bowl. 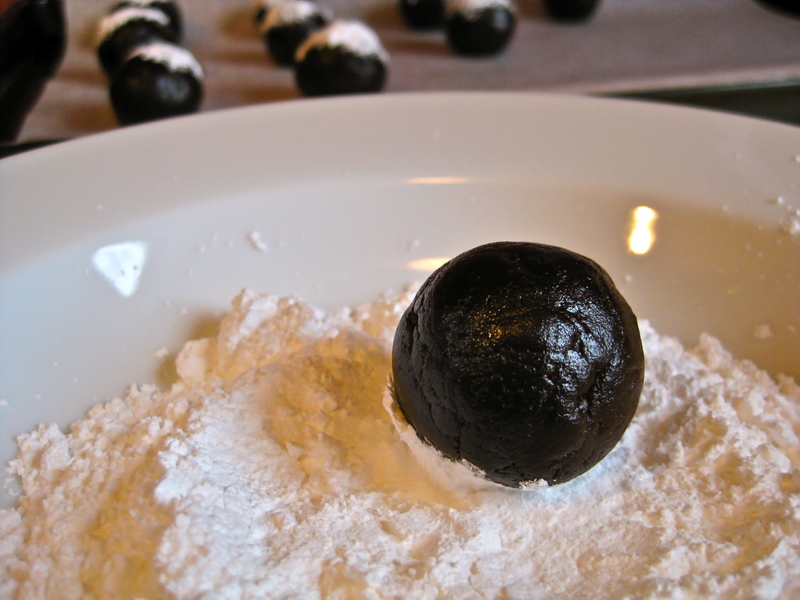 Using a tablespoon measure or a cookie scoop, form 1 tablespoon of dough into a ball by rolling it in between your palms. Dip half of the dough ball into the powdered sugar, then place the ball onto the prepared cookie sheet, powdered sugar-side up. Place the dough balls at least 1 inch apart on the cookie sheet. When you have filled a cookie sheet, very lightly and gently press down on each ball, ever-so-slightly flattening the ball just a tad. Bake the cookies on the center rack of the oven for 8-9 minutes, until the cookies begin to crack on top, and the visible insides of the cookies still appear to be quite wet. Do not overbake the cookies, as they will become very dry. Remove cookies from baking sheet to cool on a wire rack. Makes roughly 6 dozen cookies. The other day, I was actually looking for some cookie recipes on your site. Thanks for reading my mind!